From an illustrated version of Giles of Rome’s, De Regimine Principum, early 16th century. It is not often that my love of tool geekery and word geekery coincide. But over several posts about “Grandpa’s Workshop” and the besaigue (bisaigue) there have been some questions about the tool and how to pronounce the word. It is pronounced, bees-ay-goo with the last “o” there kind of swallowed. Maurice Pommier the author and illustrator of the book, offered up this info on the origins of the word. From the “Robert Dictionary:” feminine noun, dates to the 12th century, from Latin, “bis acuta”, sharpened twice – a carpenters tool with two cutting tools, one a mortise chisel, the other a chisel. From “Larousse Dictionary:” feminine noun, from Latin “bis” – twice, “acuta” – sharpened. Received my book yesterday and read it immediatly. Just could not put it down. Thanks for your effort and quality. Looks like the thing requires supreme dedication to learn. Like a harp. I can’t imagine a modern doing any kind of fine work with it. To help with the pronunciation of that strange “ue” that happens so frequently at the ends of words in French, I was taught the most accurate way to produce the sound is to start by saying “eee”, now keep your teeth and tongue in that position, but move your lips to make the “oo” sound. It makes a wonderful sound that is used nowhere in the English language that I know of. Also illustrated here but origins unconfirmed, is the need for 12 persons to stand around to watch 4 men at work. Actually I don’t imagine the besaigue to be any more difficult to learn how to use than any other timber framing tool. It requires the retraining of a few forgotten muscles perhaps but I believe the great advantage of the besaigue, besides being two tools in one and being difficulty to lose in the woodchips, is the leverage made possible by the length of the tool. 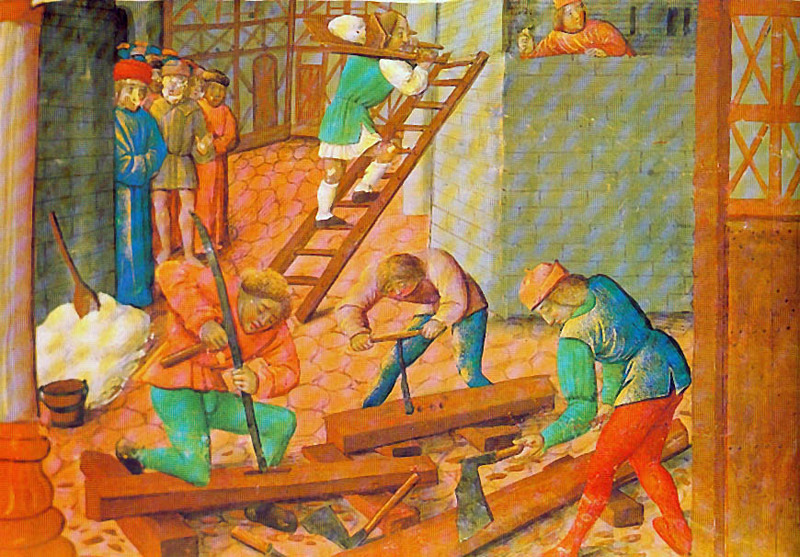 French timberframers in particular are known for working close to the ground ( was this because of the tool or was the tool because of this?). A besaigue would be less functional when attempted to be used when the timbers are raised high, as some timberframers prefer today. I have only seen the episodes online, but in his latest book he writes about the tool (spelled with an “e”) and how to use it. There is also a sketch of, incredibly, a post card St. Roy turned up somewhere of the only woman carpenter, at the time (1900 or so) in France, holding her besaigue. She’s got some kind of tool showing from a pocket, too. Looks like maybe a plumb bob coiled around a sliding bevel tucked into her pocket. The link for the photo of Juliette Caron, Charpentier. Google turns up four or five other photos of her. Turns out she’s got a rule or sliding bevel and a divider in her pocket. If a Middle-English person translated besaigue (two-bladed), he would easily come up with something like twybil. John, it is interesting. You are right. I had seen images of twybils before, and when I decided to try to translate Grandpa, I bought Eric Sloan’s “A Museum of Early American Tools” which shows a couple of variations of the twybils. I have even seen online, the illustration above used to show a twybil. The big difference that I can see is that the twybil has a relatively short head, and a long handle to be used like a hatchet or various kinds of mortising axes. Where in this illustration the tool is really long, and would be kind of hard to actually swing the thing, but it also shows the wooden handle to allow that, but would be worse than useless in pushing this tool like a slick, for instance.